Lightly grease a baking tray with olive oil, arrange the cut butternut squash on tray and sprinkle the garlic and pieces of thyme over it. Season with salt and pepper. Roast for 25 minutes or until soft. Remove form oven and transfer to food processor to make a puree. Set 2 cups aside. Lower temperature to 350° F.
While the butternut squash is roasting, cook pasta according to package instructions. Drain and set aside. Heat milk in a pot. Before it boils, add cream cheese and cheddar cheese, and stir until everything is combined. Add the butternut squash, camembert cheese, pasta and queso fresco. Adjust seasoning and add more salt or pepper, if necessary. Add nutmeg and stir to combine. Pour this mixture into a previously greased baking dish. Sprinkle with breadcrumbs and more thyme sprigs. Bake for 25 minutes or until the pasta is bubbly and the breadcrumbs are golden and crunchy. Remove from oven and let cool for 5 minutes. To give your mac and cheese a spicy touch, add a few chopped chili peppers into the cheese mixture. For some flavor variations, use brie instead of Camembert, or feta instead of queso fresco. Mac and Cheese is synonymous with comfort food, be it in its most basic form or with gourmet touches that take it up a few notches, or simply by incorporating the flavors of the season. Being that squash is currently in season, and now that it’s finally fall, I decided to add the puree of a butternut squash that I previously roasted with garlic and thyme. 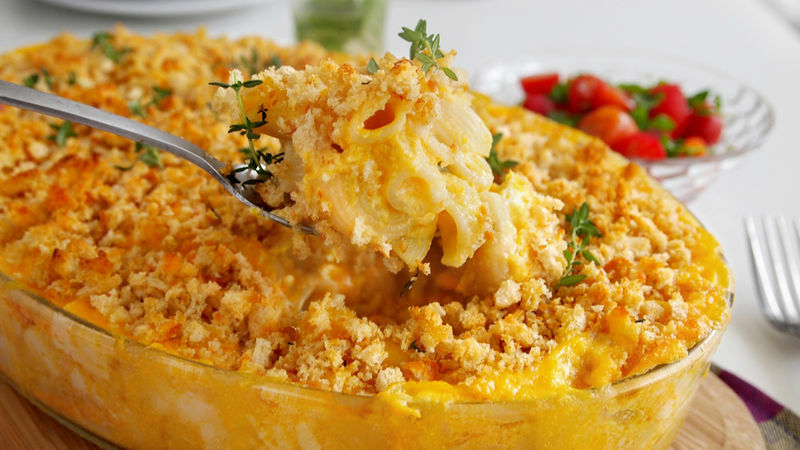 This gives the mac and cheese a creamier texture and a delicious sweet touch, without being too intense, and it also adds a beautiful color. Since I’m also a big fan of cheese, I added Camembert and a few pieces of queso fresco for a delicious texture, almost like mozzarella but without melting. This combination of cheeses gives nice body to the sauce and eliminates the need to add flour in order to thicken it. The breadcrumb and thyme topping add a nice crunchy touch, golden color and an incredible fragrance. You’ll love it!